I am participating in a worldwide writing movement to speak for compassion. Compassion is a calling. Not the kind that is only visited on a select few - it is a calling for each of us. You may have silenced its voice, pushed it down and back until you can't hear its gentle leading, but it is still there. Calling out to you. This is the whisper of compassion. Love is the difference between true compassion and what is so often just disguised pity. Love is the feeling that bubbles up in your heart and shows itself in your actions. Love is what makes you dig deep, give sacrificially, hug a stranger, smile, listen closely, share tears, forgive, seek understanding, and reserve judgement. Compassion reminds you that you know better now, but it wasn't always that way. And it enables you to see those around you with grace. There is a verse from the Bible that echoes in my heart - usually at the most inopportune times when I am happy in my selfishness, secure in my pride, or not wanting to put others first or even consider their feelings at all. because love covers over a multitude of sins. And if I listen to that echo, if I allow it to penetrate the wall I'm so often building around my heart, I will stop and think about love. Deep love. Love that covers sins also covers misunderstandings, confusion, differences, and all manner of pain. It is easy to love my family. Sure there are small things like the one millionth conversation about leaving shoes in the dark walkway, and big things that are more important and harder to resolve, but the love is always there under and around it all. It is easy to love my friends. Even when they make different decisions than I might make, or walk paths I would never choose for them, I can almost always see their side of the story. I might not agree, but I can understand their hearts and feel their pain and joy, and I love them exactly where they are. But what about the rest of world? The people I don't know, the people who don't hold pieces of my heart in their hands? The ones who I don't understand at all, whose words don't even make sense to my heart? What about the people who are fast and harsh and rude? The ones with jagged edges and not a soft spot to be seen? What is my response to these people? Is it love - deep love - love that covers...everything? But love covers all transgressions. Oh readers, not always. Not enough. I often do not look past my own feelings to care for another's. I often hold myself back from the pain. I rush past. I do not seek to listen, to understand, to love deeply. Here's the truth: Love is messy and compassion requires work. You can not step in and out of compassion when it suits your day. To have true compassion, you must allow yourself to be open to another person's heart and story and truths; you have to be willing to stop and listen to not just their words but their very souls. True compassion must be mixed with the love that covers all the cracks and broken places and makes us whole. This is the calling of compassion: To share your life and your heart with those around you. To let go of hatred and anger. To give the same grace to others that you would wish for yourself. To listen before you make up your mind, and to cover all the things, with love. If you listen closely, you will hear this calling echoing through your heart. Reminding you to love, to serve, and to practice compassion every day. 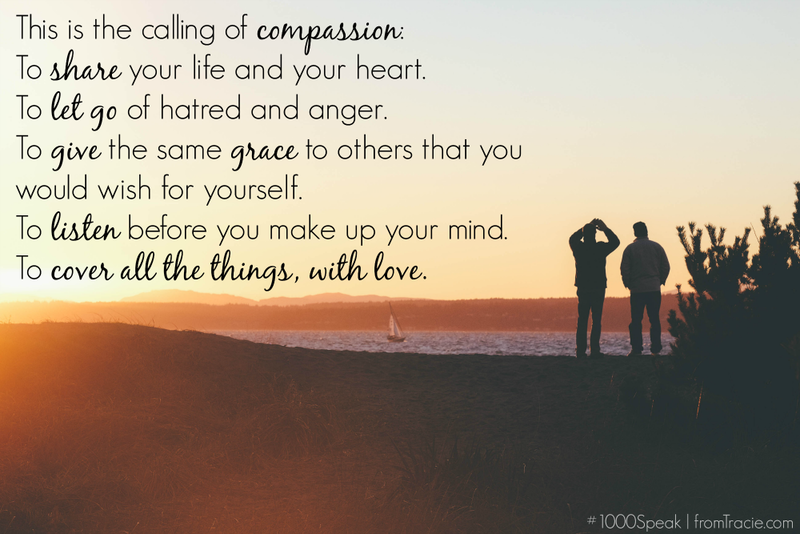 Today, over 1,000 bloggers are joining together to write about compassion. It started with a blog post from Lizzie and an idea from Yvonne, and blossomed into a beautiful community. 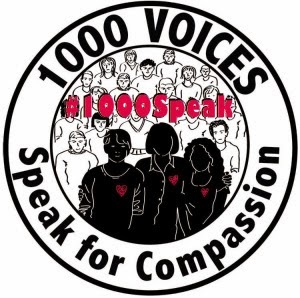 You can find out more about #1000Speak For Compassion here. Beautiful and definitely may be a bit of a challenge, but as The Beatles said, "All you need is love". Thank you for this inspiring post. Hugs, Tracie! Love does cover a multitude of sins! And when we view through the eyes of compassion, the world is more beautiful. Glad to be in this with you! I am blessed beyond measure to have the opportunity to practice having compassion everyday at work. Compassion is kindness, being gentle and caring with my alzheimer's dementia patients. Even when they are hitting, swearing and being mean. I have learned that compassion is one of the most Christ like attributes we can work to have. Because, with compassion you should also have a soft heart, forgive easy and love unconditionally. Glad I found your blog. Found via SITS Girls! So thankful for His compassion towards me - praying I can offer it to others often - the way one might a cold drink of water on a hot day. Grateful for your reminder. "Compassion reminds you that you know better now, but it wasn't always that way. And it enables you to see those around you with grace." I love that. Exactly! Grace! Why didn't I use that word?! Our failings and flaws are the tools we need to act compassionately towards others. A very inspiring post. Great job. It is a very, very inspiring post! We could ALL use more compassion and I need to be constantly reminded of that! Love is messy and compassion takes work! I agree absolutely. But what would be without both? This is lovely and thought-provoking and true. I am constantly struggling with compassion - I think I am pretty good at offering it, but I find myself struggling to offer compassion to those who themselves cannot offer it. I get frustrated that they cannot see that the answer IS love. And then I remember that these folks - like the kids I work with every day - need the love the most. They are the ones who need compassion the most.But it is hard. Compassion is taking the time to share life moment with someone when no one else will. Take for instance my picture on my twitter page. The man that stands next to me is a homeless man who lives along Venice Beach, CA. He was having a bad moment and I took the time to share my hours on this beach with him, listening to him and letting him know that he too mattered. Compassion is letting others know that they matter. I love this! I find that patience and love/compassion go hand in hand. It's extending grace to my children when they destroy my house yet again. It's found in a smile and warm words to the difficult person. It's in the small acts I do for my husband, over and over again, such as picking up his dirty dishes without a harsh word. Thanks for the reminder that the love of Jesus takes many different forms. It was a pleasant surprise to find another Christian blogger through SITS and I'm following you now! This is pretty much perfect - I haven't read a lot of the compassion posts yet but this one.. it's just it for me. I don't have the compassion I could have. I do have the love I could have, but to extend it into more compassion, even for myself, would be big. Indeed! Compassion is love, patience, understanding! Wonderful post, Tracie! I absolutely love this post, Tracie! You wrote and explained compassion so perfectly! It does require work, but OH the benefits for both ourselves and others in doing it - so truly rewarding and so very much needed. Thank you for inspiring us all to try harder!